Anatomy - A dog’s ears are quite different than our human ears. Their ear canals form a shape that resembles an upside down horn. This makes it more difficult for debris to get out as it must work its way upward. Risk Factors - Anatomy alone leaves all breeds at some risk of developing ear inflammation. However, some breeds are more susceptible to ear infections. This can be due to more wax producing cells in the breed, such as in the Labrador Retriever, or a narrower ear canal, as in the case of Chow Chows. Allergies, hypothyroidism, living in a humid environment, parasites, and frequently swimming or bathing can also contribute to ear problems. 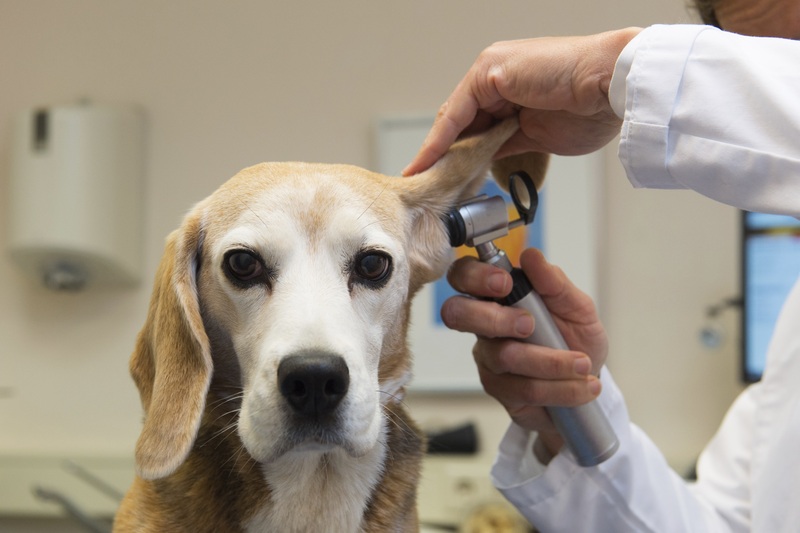 The best policy is to include ear care as part of your dog’s weekly grooming and watch for signs of trouble so it can be treated right away before it become more serious. When in doubt, your veterinarian is the person you want to talk to. Give them a complete history and then allow a full examination. The vet can take a sample of wax from your dog’s ear to determine if something is wrong and what the proper course of treatment will be. Sometimes minor inflammation just requires a cleaning or two, while full infections may require a prescribed medication to get rid of the issue entirely. Ear infections are quite painful for your dog, and getting relief quickly is the key to treating them successfully. Have your dog lie down on his side on a comfortable surface, such as his bed, where you can reach him easily. Now open his ear flap (if he has drop ears) and gently insert a few drops of the cleaning solution into the ear canal. Massage the base of your dog’s ear to let the solution move in. If he shows any signs of pain at this point, stop immediately and consult your vet. After a minute or two of massaging let your dog get up to shake it off. Use a large cotton ball (**never use a Q-tip as they could potentially cause damage**) to clean any excess solution or debris out of the ear. Give him a treat for being such a good dog. Just by knowing what to look out for and by taking a few steps to prevent inflammation you can help your dog spend less time itching and more time enjoying the things they love most. About the contributor: Lindy Callahan is a travel and lifestyle writer living in the Pacific Northwest. She is a huge proponent of animal adoption, and has an 8-year-old dog named Phil Collins that she adopted a few years ago. She and Phil Collins love spending their free time exploring the Northwest, while hiking, paddle boarding and swimming throughout the region.